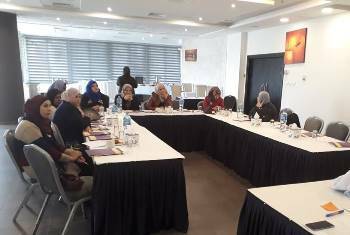 On December 29, 2018 MIFTAH capped off a three-day training workshop on communication, leadership, assertion, teamwork and media skills in the southern, northern and central districts of the West Bank as part of its project, “Support Women Participation in Public Life”. The project, which is funded by the Norwegian Representative Office, targets female members of local councils. Trainer Marlene Rabadi said one of the most important outcomes at the cognitive level was introducing and understanding of the concept of leadership, the patterns of leadership, the tasks assigned to it and the qualities of an effective leader. Another important outcome was understanding and learning about means of communication with the media and ways of advertising and promoting the activities and projects they implement through their local councils, in addition to learning about means and methods of asserting oneself. Rabadi recommended the need to expand the scope of knowledge among the trainees on political, social and economic issues and to hold training sessions for them on gender issues. She said many of them held ideas that reinforce women’s inferiority, especially the older local council members. Communication skills: The training focused on communication skills and teamwork in terms of the features of a team, the rights and duties of each team and the leader, the definition of communication, its properties, goals, means, methods and steps towards conveying messages, in addition to the components of effective communication and the qualities of an effective communicator. Communicating with the media: The training also focused on communicating with the media through tools to build relationships with media outlets for advertising and promoting activities, projects and advocacy campaigns which the local council members plan and implement; writing news on the events in local councils in terms of: the components of writing a news piece; the means for sending it to the media and guaranteeing its publication; mechanisms for building a relationship with the media to promote a campaign; corresponding with local radio, television and satellite stations in order to mobilize journalists and the media, urge them to give attention to local council activities and to build a relationship with them and earn their trust. Assertion and leadership: The subject of assertion and leadership occupied an important part of the training. It included: the definition and types of leadership; who is a leader; the difference between a leader and a boss; qualities of an effective leader; the difference between a natural leader and a leader trained to lead; the definition, importance and ways of self-assertion; patterns of various ways of thinking; patterns of various personalities; relationships that show a lack of self-assertion and how to boost this assertion. استهدف عضوات هيئات محلية في ثلاث محافظات..